It isn't just humans who experience that tumultuous, teenage period of growth, angst and self-discovery. Certain Pokemon go through this transition as well. Look at any three-stage Pokemon - meaning one that has three evolutions - and you'll see a pretty clear child to teenager to adult progression happening. The child stages are typically cute with their big eyes and chubby little bodies, while the adult stages look strong and powerful. Then there are the teenage stages, those awkward middle years. Some Pokemon - such as the too-cool-for-school Wartortle - sail through this stage with style and class. Others, well, let's just say they're bit messier. 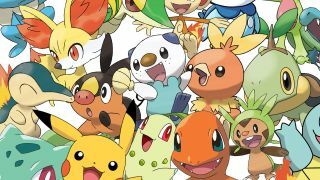 Here are our top 15 picks for the most awkward middle-stage Pokemon, ranked in order of personal awkwardness. Never fear, however, as each entrant is destined for greater things in about 15 levels or so. Most Awkward Aspect: Shelgon's shell. This Pokemon won't get anywhere in life until it learns to break out of that hard exterior. And by 'get anywhere' we of course mean 'transform into a giant freaking dragon'. Most Awkward Aspect: Vanillish's resemblance to an ice cream cone. This in and of itself isn't all that bad. However, it does create some very awkward moments when your friend scarfs down a tasty frozen treat only to realize it was YOUR NEW POKEMON YOU MONSTER!! Most Awkward Aspect: Golbat's giant, gaping mouth. Do you have any idea how many dead bugs and leaves and who-knows-what-else must be caked up inside there? I know bats eat bugs so that's not so bad, but it should really know to close its mouth while eating. Most Awkward Aspect: Gurdurr's bulging blood vessels. Do you think if you put your hand up to one you could feel it move? Can you see it pulsating when Gurdurr lifts that heavy girder? And why pink? That's an interesting complement to its completely grey body. Most Awkward Aspect: Sliggoo's gooey body. This Pokemon looks like the sort that just loves to give hugs. Too bad its slug-like body means it's going to leave a little bit of itself behind after each one. And don't expect that stuff to wash out, either. Most Awkward Aspect: Piloswine's hair. This Pokemon's hairy body symbolizes every teenage hairstyle. It's long, shaggy, and the bangs hang down in front of its eyes. We bet its mom has to constantly brush them out of the way whenever it's time for a family photo. Most Awkward Aspect: Weepinbell's foul mouth. How do you think Weepinbell gets around? Does it use that little hook on its head, or maybe those leaf arms? Nope, it has to be the mouth; the same mouth that drags it through the mud and the dirt and who knows what else. Most Awkward Aspect: Palpitoad's creepy smile. Why does it have to look so devious? Did it just play some sort of horrible prank on me, and I haven't realized it yet? I thought we were friends, Palpitaod. Also, that smile reaches a whole new level of creepy in its next form. Most Awkward Aspect: Eelektrik's unreadable expression. Is it supposed to be confused? Surprised? Happy? It doesn't look like it's entirely sure of what's happening right now, but would certainly appreciate it if someone could please stuff some food into its mouth. Most Awkward Aspect: Boldore's black, soulless eyes. They're the sort of eyes that make you feel as if you're sinking into the endless maw of the abyss. The yellows around them draw you in, deeper and deeper, slipping away until you until you... wait, what were we talking about?